Despite initial thoughts - cloth pads are simply fantastic! 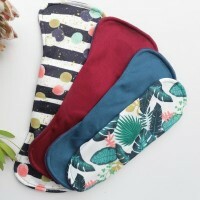 They are so very comfortable, and dont have the irritating chemicals associated with disposable pads. You can wear natural luxurious cotton velour against your skin (rather than plastic) and save yourself lots of cash in the long run. Cloth pads are designed to last for years! BBH Ecopads are made with a core soaker of bamboo fleece attached to a hidden layer of bamboo jersey, a layer of PUL (to prevent leaks). All topped with gorgeously soft royal purple cotton velour. The pads' wings snap into place with our high-quality resin snaps. Experience the softness and comfort of cloth pads. It's the most natural and comfortable way t..